Here in the library are gathered a few articles about vintage clothing and how to deal with it. There's plenty of excellent advice online so please consider this my personal (and often rather opinionated) take on the subjects. I'll be compiling a list of useful links which will be added very soon. Vintage enthusiasts tend to be collectors as much as wearers, and have a keen interest in maintaining and preserving their precious items. Its an attitude that's becoming more prevalent as the realisation dawns that the world's resources are finite, 'fast fashion' has some long-lasting and horribly unpleasant consequences, and that living sustainably does not necessarily mean forsaking style and glamour. It just takes a little bit more effort, that's all. 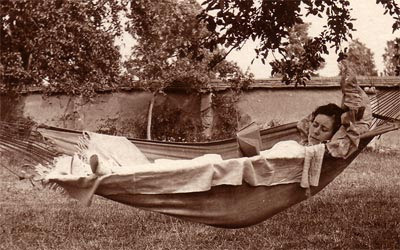 Reading in style, Haddenham, Buckinghamshire, 1922.